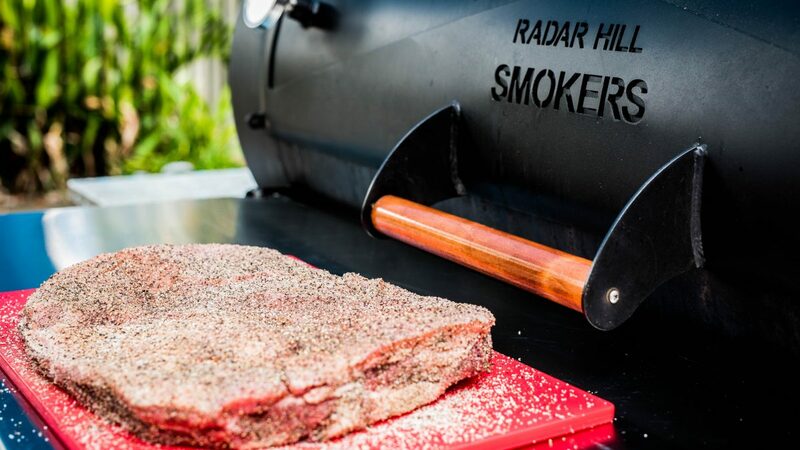 Anyone who claims to be a barbecue lover knows beef brisket is pretty much the holy grail cut when it comes to smoking great beef. But there’s a couple of different parts to a brisket and sometimes they’re called different things in different countries. 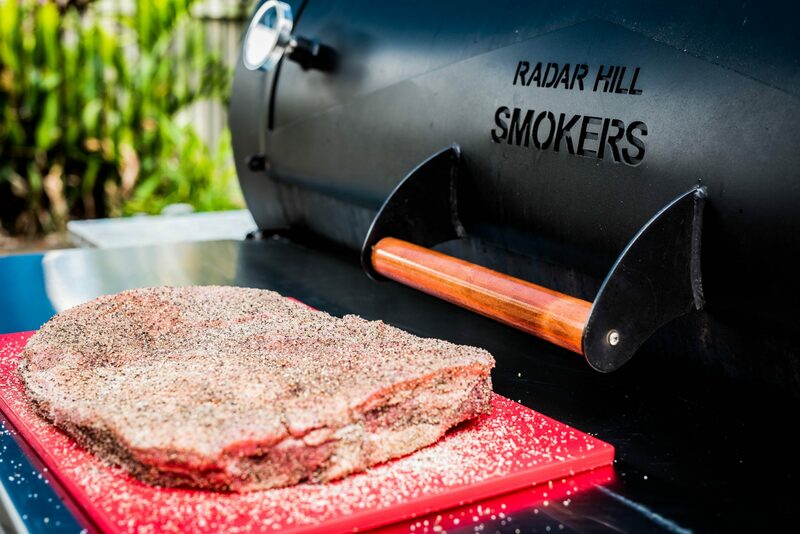 We all know and love the point brisket, or what is also called the packer brisket. But there is a different cut that is delicious and moreish when prepared correctly – the beef navel. In the United States, what we might call beef belly is also called a navel or a plate. In the UK, they call it navel end brisket. It’s basically the equivalent of a pork belly, but on a beef. Debate can rage about whether it’s part of the brisket or not, but for our purposes let’s just stick with calling it the beef navel. I’ve used this navel cut for several different things. 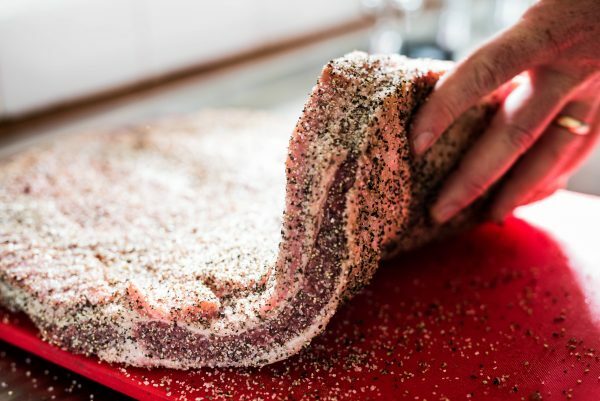 You can smoke it, like the images in this article show, or you can make pastrami, cure it and some people even make homemade beef bacon, as well. It has a bit more fat on it, so you should trim that down to about a centimetre. When putting it in a smoker, the hard, outside fat on a big piece of meat like this doesn’t render down, but it can offer some protection. You can put the side with the centimetre of fat and the harder fat facing the heat source, for instance, to just give the meat a bit of protection while you’re cooking it slowly. Then you’ve got the other side. It has less fat but gets what we call the silver skin. You should try to trim off as much of the silver skin as you can. It doesn’t melt either, so it can be quite chewy. If you’re in a barbecue competition, for instance, you should remove 100% of this. It’s quite a tedious job but it will be worth it. It can act as a barrier to smoke, so getting rid of it means more chance of getting a nice smoke ring. It’s also important that the whole thing’s quite even and flat. For home cooking you may not be too fastidious but it’s vital in competition cooking because you want every slice to look identical and you want a nice, even cook. Now that we’ve trimmed, we want to apply a simple yet effective rub. You can use a binder such as American mustard or Worcestershire sauce but be careful not to use too much. If you layer it on too thick your bark can get really thick and crusty, and not in a good way. You want a nice, strong bark on your beef, but you don’t want that sort of thick, almost pasty bark. For beef it pays to keep it simple: just go salt, pepper and a little bit of garlic powder. That’s Texas-style and we all know the Texans know barbecue. Apply it evenly and liberally but try not to make it too thick. And ensure you cover the entire piece of beef. You can then leave it for 15 minutes or so to tack up before putting it in the smoker. If you’re already a barbecue boss you know what to do. If not, get your smoker to a temperature of about 250F-260F (120°C-125°C) and then go for it. You can wrap the navel when the internal temperature of the meat reaches about 170F (75°C) and you’ll know it’s done when it probes like butter, which will probably be between 190F (87°C) and 205F (95°C). Let it rest for a good 45 minutes before serving. There’s a long line of fat that runs through the navel cut, which makes it ideal for beef bacon and curing. When smoked it’s still a delicious cut of beef but the fat line, as you can see in the images, is quite pronounced. It’s tasty stuff all the same.